Facts on the Zika Virus and how it can affect your health. What are the facts on the Zika virus? It is the 21st century and we have to battle new diseases and illnesses every day. Zika virus is one of those modern day health risks that US cities such as Miami, Florida have to had to take extreme measures to prevent outbreaks. Zika virus is a mosquito borne virus that is transmitted by daytime-active mosquitos. You may have only recently started hearing about Zika virus, but it was first isolated in the Zika Forest of Uganda in 1947. From the 1950s, Zika virus was only reported from within a narrow equatorial belt from Africa to Asia. With modern day transportation allowing global travel, since 2007 the Zika virus began spreading eastward to the United States which lead to the Zika virus outbreak in 2015 and 2016. Acknowledging the fact that Zika virus is now a real threat, we need to be intelligent on the issue and do everything we can to protect our families from getting infected. Zika virus symptoms are often nonexistent or only manifest themselves in mild forms. 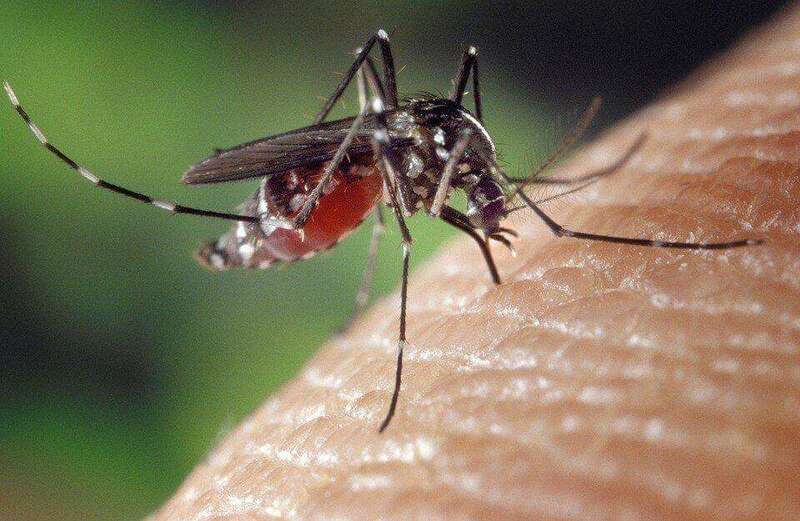 The mild Zika virus symptoms are reported to be similar to a mild case of dengue fever which includes fever, red eyes, joint pain, headache and rash. One reason why it is so important to know Zika virus symptoms is because it can cause pregnant women to give birth to children with microcephaly and other serious brain malformations. If you don’t know already, microcephaly is a condition in which the brain does not develop at the appropriate rate and causes a smaller than normal head. Microcephaly is a very serious disorder and will cause intellectual disability, poor motor function, poor speech, abnormal facial features and a host of other issues. If you are a pregnant woman, we highly suggest that you find some natural mosquito repellent that you can wear on a daily basis in order to protect your child from the dangers of microcephaly and Zika virus. Another important reason to be aware of the Zika virus symptoms is because the Zika virus has been known to cause and be linked to adults developing Guillain–Barré syndrome. Guillain–Barré syndrome is the rapid onset of weakness in the muscles caused by the immune system damaging the peripheral nervous system of your body. We are still unsure as to how Zika and Guillain–Barré syndrome are related, but once you develop these symptoms recovery can take weeks and in some cases years! Also, about one third of individuals who experience Guillain–Barré syndrome, develop a lasting weakness. While recognizing the Zika virus symptoms will help you understand what you are at risk for in the future is nice, early recognition won’t help you recover from the infection any sooner. Like all viral infections, you just have to work through it. The only Zika virus treatment available at this time is acetaminophen and some good rest. Zika virus treatment rarely ever involves a trip to the hospital. Since there is not anything you can do for a Zika virus treatment once you are infected, let us focus on the precautions that we can take in order to prevent infection. Zika virus prevention is something that you are going to have to implement in to your daily life if you live in an area with known cases of infection and hopefully you are already aware of these tips. If you are pregnant you should also follow these Zika virus prevention tips no matter where you live, you can never be too safe now days! The best thing that you can do to stay Zika free is to find yourself a good natural mosquito repellent. With all of the reports of pesticides and chemicals like DEET causing cancer and other strange diseases, let’s not kill ourselves using nasty man made mosquito repellents just trying to do a little Zika virus prevention. The chemical DEET is so poisonous that even the Environmental Protection Agency says you should wash it off of your skin as soon as you no longer need mosquito repellent. This chemical actually causes death to mosquitos that come into contact with it so you better believe that there are underlying health consequences that will arise when using such chemicals on any sort of regular basis. What I use personally for a natural mosquito repellent and would recommend to all of you reading this is an essential oil blend by doTERRA called TerraShield. It is a blend of eight essential oils that are all known to possess properties that protect against many environmental annoyances. And trust me, this spray keeps the mosquitos away! These oils are derived from plants that develop their own natural vapor barrier that protects them in their natural environments, the outdoors! The natural mosquito repellent, TerraShield, is made up of: Ylang Ylang, Cedarwood, Catnip, Lemon Eucalyptus, Litsea, Arborvitae, Nootka and Vanilla Bean extract. One thing I enjoy about this blend is that it actually smells good unlike some of the other DEET chemicals I have used in the past. Some other good Zika virus prevention methods are to not travel in areas that have been known for having Zika cases. Also, try to wear long sleeves, pants and anything else that can help cover your skin when you are outdoors. Most mosquitos begin to bite you around dusk, but since Zika mosquitos are day time biting species it can be harder to avoid them. Zika virus awareness is a requirement to stay healthy in today’s world and I hope you are now better prepared for Zika virus prevention and recognizing the Zika virus symptoms because of this post. It is a misfortunate case that we live in a world where something as small as a mosquito bite can cause such terrible conditions like microcephaly and Guillain–Barré syndrome. If you live in an area with known Zika cases or are a pregnant woman, please take my advice on Zika virus prevention seriously. If you implement wearing a natural mosquito repellent into your daily routine, you will thank yourself when you have a healthy young disease free child and lead a healthy lifestyle.